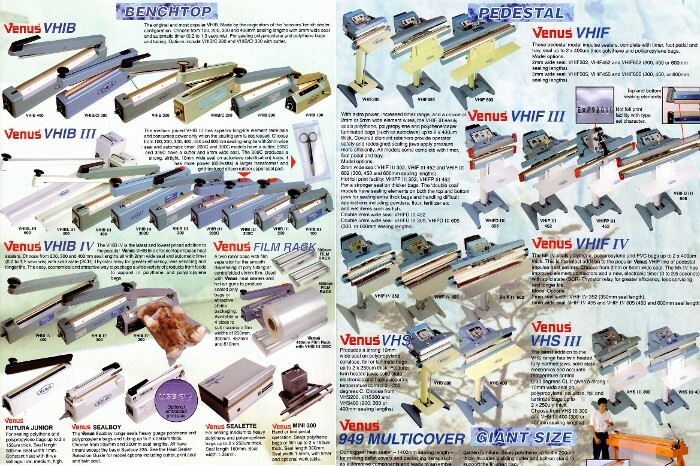 The popular Venus VHIB line of sealers. Choose from 200, 300, 400 and 500mm seal length all with 2mm wide seal and automatic timer (0.2 to 1.5 seconds) with solid state(SCR) thyristor replay for greater efficiency, less servicing and longer life. The easy, economical and attractive way to package a wide variety of products from foods to apparel in polythene and polypropylene (PP) bags. Please contact us for more Heat Sealers to choose from Benchtop (Optional Embossed Print Seal, Cutter, Twin Seal), Foot Operated, Magnectic Hold-Down, Hand Held, Wall Mounted, Heavy Duty, Automatic, Pedestal, Giant Size, Special Purpose such as Corner Crimper, Cello Sealer, Hand Iron, Plate Sealer, Clingfilm Dispenser and many more..